Uncut (p.104) - 4 stars out of 5 -- "1978's fine DOA: THE THIRD AND FINAL REPORT reflects the world in strange and bold ways." Personnel: Genesis P-Orridge (vocals, violin, bass guitar); Cosey Fanni Tutti (guitar, tapes); Chris Carter (synthesizer, tapes); Peter Christopherson (tapes). Audio Remasterer: Chris Carter . Liner Note Author: Al Ackerman. Though it wasn't until 1981 that they finally got around to splitting, 1979's D.O.A. was subtitled "The Third and Final Annual Report," and in many ways, it does sound like a summation of everything Throbbing Gristle accomplished in their years together. It's got humor (their 1978 underground hit "United" is included, albeit in fast-forward, so that the four-minute song lasts 16 seconds), shock-tactic horror ("Hamburger Lady" is a graphic account of a burn victim), and no end of fascinating/disturbing lyrical imagery and musical experiments. 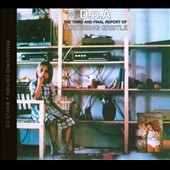 Unlike their first album, SECOND ANNUAL REPORT, D.O.A. is largely studio created and consists of 13 discrete pieces, each with a theme and musical style of its own. Chris Carter's ABBA-meets-Kraftwerk "AB/7A," and Genesis P-Orridge's near-suicidal "Weeping," show the group's conceptual and musical range. This reissue also includes both sides of the single "Five Knuckle Shuffle"/"We Hate You (Little Girls)."